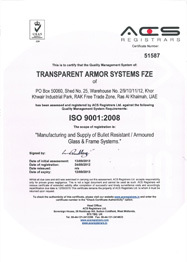 Transparent Armor Systems is ISO 9001:2008 certified. We strictly enforce and adhere to the highest level of production quality and manufacturing standards as guided by the internationally recognized Quality Management System. We always keep in mind that our products save lives and give utmost efforts to meet and exceed standards of protection.